Project obstacles and solutions: The Sanitary District of the City of Muncie, Indiana announced a plan to separate their combined sanitary and storm sewers in the downtown area from Franklin Street to the White River. Combined Sewer Overflow (CSO) poses a health risk whenever there is a heavy rain or a snow melting event that outpaces the waste water treatment facility's ability to process it. In their EPA approved plans, the Muncie Sanitary District called for the first phase of a new sewer line to be built that would be separated from the current combined system and handle only storm water. The system would move water to a holding area and water garden park area before discharging into the White River. Bowen Engineering was selected as the contractor for this project. E&B Paving did all of the sidewalks, curbs and asphalt paving. Whenever you are doing this kind of invasive work, there is considerable pressure to get the job done right, but also to do it as quickly as possible. Block by block, streets in downtown Muncie were closed and torn out. Traffic patterns were altered and the downtown business district was impacted by the street closures. There were 67 days scheduled to complete all of the concrete work. 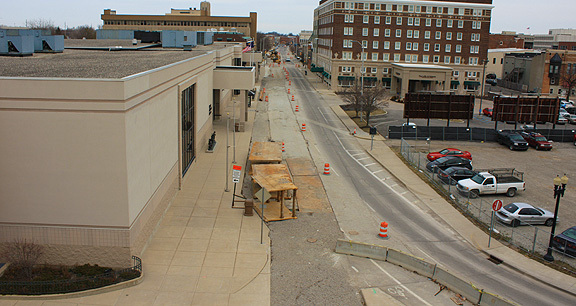 That included over 83,000 square feet of concrete paving and 2,815 linear feet of curb work. Both aggregates and concrete had to be delivered on time to keep the project on schedule. Bowen filled the street cuts with crushed stone. The streets were compacted and topped with a 3,000 psi concrete mix as a subsurface slab. This was groove finished to provide an excellent bonding surface for the final asphalt paving. Bowen depended upon IMI to deliver both stone and concrete as soon as the new pipes were installed. As each block of the project was completed, E&B paved new sidewalks, curbs and gutters. This allowed streets to be systematically opened before others were torn out. In total, IMI supplied 3,300 yards of concrete for this project. That included 2,142 yards for the 9 inch concrete roadway paving, 76 yards for the concrete approaches, 197 yards for the sidewalks and wheelchair ramps. In addition, IMI supplied concrete for 2,300 linear feet of barrier curb, 365 linear feet of curb and gutter, and 150 linear feet of rolled curb. IMI Aggregates also provided 30,000 tons of crushed stone to backfill street cuts, along with rip rap as an erosion control and filter in the spillway area. For more information on IMI Aggregates and products at each quarry, click here. For more information on paving with IMI Concrete, click here.